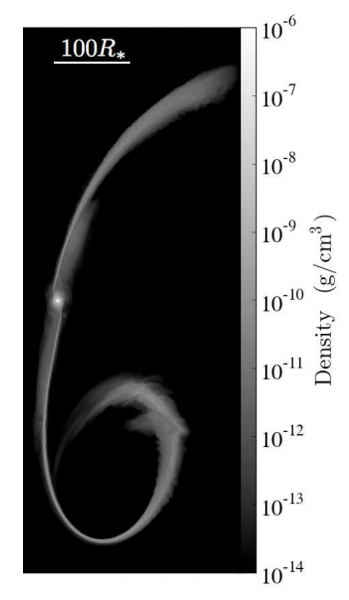 The bound and unbound tidal tails of gas stripped from a 1.5 solar mass, 50 solar radii giant star as its atmosphere is disrupted by successive passages near a supermassive black hole. Here, the star is ~50 AU from the black hole. (Adapted from Figure 1 of this paper). Today, we take a look at the feeding habits of the elusive quiescent supermassive black hole. Supermassive black holes (SMBHs) are believed to lie at the centers of almost all large galaxies, but in the present day most of these SMBHs, including the one in our own Milky Way (Sgr A*), are not active. We can still see low-level emission and flares from these black holes in wavelengths from radio to infrared and X-ray as they consume snacks, making their accretion disk glow as it dissipates the gravitational potential energy released by this fuel (read more about that in this astrobite). However, in general these SMBHs are quiescent: their accretion luminosity is orders of magnitude below the Eddington limit, the maximal amount of gas a black hole can accrete before the luminosity of this process prevents any more gas from falling in. Why are the luminosities so low for typical SMBHs today? To understand this, astronomers are trying to identify all the possible sources of fuel for quiescent SMBHs. One of the most readily available food sources for a hungry SMBH is, of course, stars. When it comes to stars, SMBHs are known to both be messy eaters (disrupting and swallowing entire stars, as we may catch our own SMBH, Sgr A*, doing soon) and constant snackers (feeding off of winds from the surrounding stars). This paper suggests that there is a third behavior: spoon feeding. Here, the SMBH stretches a single meal (consuming the atmosphere of an aging giant star) over the course of tens to hundreds of stellar orbits. The authors of today’s paper simulate the evolution of a star into a red giant while under the gravitational influence of a nearby SMBH, investigating the gradual tidal stripping of its atmosphere as the star orbits and evolves: increasing in radius and decreasing in mean density. The trouble starts when the star gets big enough that tidal forces from the SMBH win a tug-of-war with the star itself to keep its atmosphere (the star overflows its Roche lobe) and the SMBH starts feeding on the stripped atmosphere. After this point, it is a losing battle. Every time the star’s orbit takes it close to the SMBH (pericenter approach), the star gives up more gas (Figure 1), “spoon-feeding” the SMBH for orbit after orbit, until these simulations show that the star entirely loses its atmosphere, and only a (white dwarf) core remains. This process is not flashy– none of the individual “courses” making up the entire meal of eating a star’s atmosphere yield a huge flare in the SMBH luminosity like that from consuming an entire main sequence star. However, for especially quiescent SMBHs, slowly sucking away at these giant stars may actually contribute more to feeding the SMBH than disrupting entire main sequence stars. The authors also predict that, for sufficiently massive galaxies (hosting SMBHs > 108 solar masses), there should be enough of these evolved stars orbiting near the SMBH for this spoon feeding to occur nearly continuously. 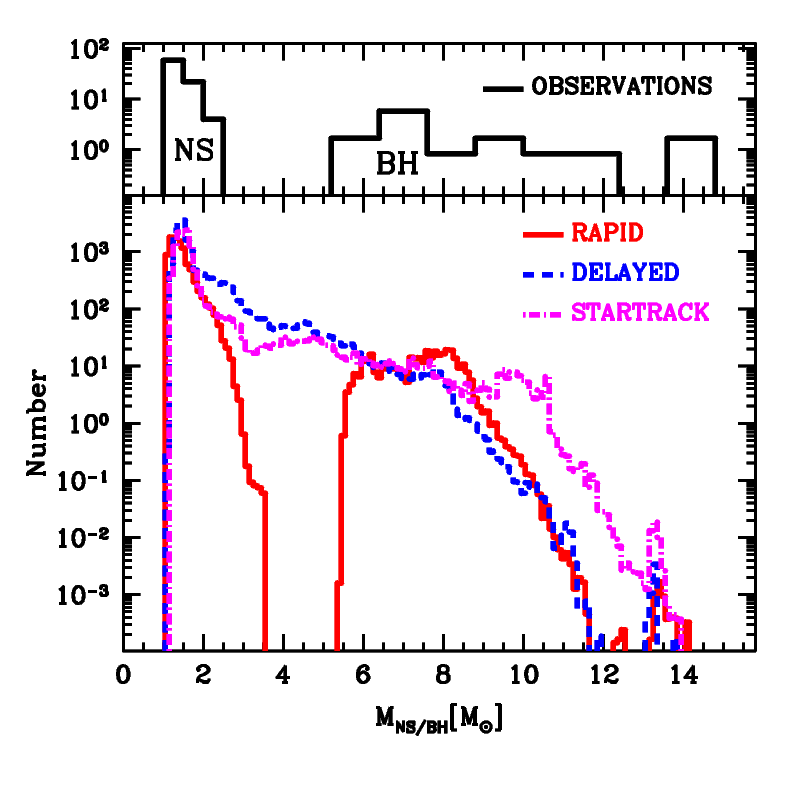 For such massive SMBHs (see Figure 2), the contribution to their growth from spoon feeding may be comparable to that continuously accreted from diffuse stellar winds, as spoon feeding is a much more efficient process (much more of the material coming off of these giant stars is likely to ultimately end up inside the SMBH). In the end, in the world of extragalactic as well as earthly nutrition, constant snacking may still not be a substitute for one hearty meal, even if it takes thousands and thousands of years to finish. Chew on that slowly.